AKC Rally is a companion sport to AKC Obedience. Both require teamwork between dog and handler along with similar performance skills. 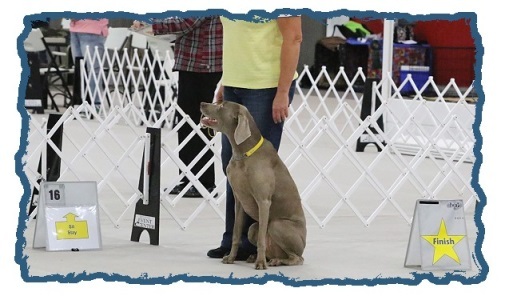 Rally provides an excellent introduction to AKC Companion Events for new dogs and handlers and can provide a challenging opportunity for competitors in other events to strengthen their skills. The dog and handler team move at their own pace, very similar to rally-style auto racing. Rally was designed with the traditional pet owner in mind, but it can still be very challenging for those who enjoy higher levels of competition. A rally course includes 10 to 20 stations, depending on the level. Scoring is not as rigorous as traditional obedience. 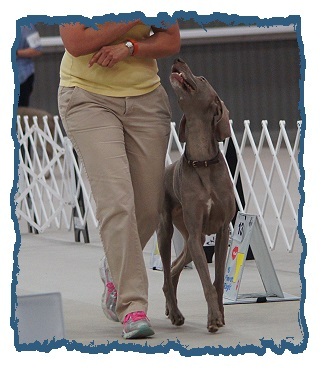 Communication from the handler to the dog is encouraged and perfect heel position is not required, but there should be a sense of teamwork and enthusiasm as they go through the course. The signs may be any color and they include descriptions as well as directional arrows of exercises. Signs are numbered to make it easy to find the next station when navigating the course. All signs are placed to the handlers right side. The signs are large enough to be easily recognized when going through a course. The exercises designated on the signs will be performed in close proximity to the sign itself, either directly in front of, or in front of and to the left of the sign. NOVICE - this is the first level for those just getting started in competition. • All exercises are performed with the dog on leash. • There is a requirement of 10-15 stations to complete with no more than five stationary exercises. • The exercises performed vary from turning 360 degrees to changing paces during the course. 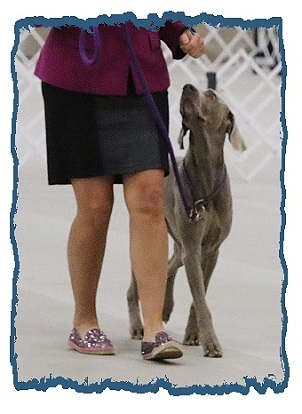 • Exhibitors at this level may clap their hands, talk to the dog, and pat their legs through the course. • All exercises are performed off-leash. • There is a requirement of 12-17 stations with no more than seven stationary exercises. EXCELLENT - this third and highest level of AKC Rally is the most challenging. • Exercises are performed off-leash except for the honor exercise. • There is a requirement of 15 to 20 stations, with no more than 7 stationary exercises. • Handlers are only allowed to encourage their dogs verbally. Physical encouragement is not allowed at this level. 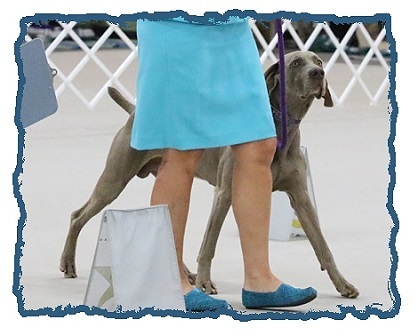 • The Excellent–level exercises include backing up three steps, while the dog stays in the heel position and a moving stand, while the handler walks around the dog. A qualifying performance indicates that the dog has performed the required exercises according to the AKC Rally Regulations. Each performance is timed, but times are only counted if two dogs earn the same score. All dogs and handlers begin with a perfect 100. A dog and handler team is awarded a qualifying score if it retains at least 70 points after the course has been completed.